Ready for some head to head to fun? 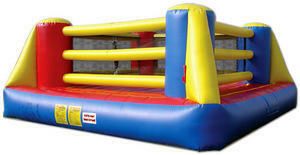 The Inflatable Boxing Ring rental is the ideal challenge for those looking to be the champ. The Inflatable Boxing Ring takes the sport of boxing to a whole new level, without compromising on safety. The gigantic boxing gloves and safety helmets will make sure you have the fun without the bruises. Go a few rounds for some fun and excitement!